How to write and publish your own OUTRAGEOUSLY Profitable eBook in as little as 7 days even if you can't write, can't type and failed high school English class! 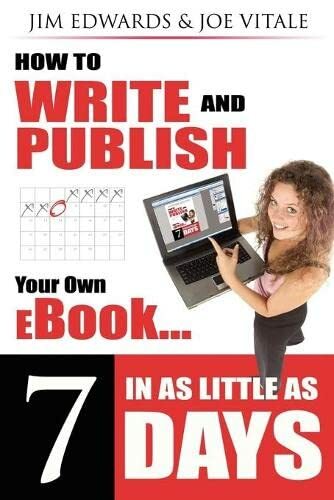 Discover the secrets to having your own, outrageously profitable ebook written and published as quickly as ... only 7 days from today! Jim Edwards is a dynamic and entertaining speaker who has developed, marketed and operated outrageously profitable online businesses for both himself and his clients worldwide since 1997. He enjoys writing, walking, softball, playing video games and listening to Elvis, Frank Sinatra, and Willie Nelson. Jim publishes a FREE no-holds-barred, ?tell it like it is? multi-media newsletter at www.IGottaTellYou.com! Jim is a frequent guest speaker nationally at conferences and seminars on such subjects as search engine and directory traffic generation, ?shoestring online marketing? and more. He is the author and co-creator of numerous highly successful ebooks and ?info-products, ? including: ? ""5 Steps to Getting Anything You Want!? Discover The 5-Step Goal Achievement System That Gives You A Positively Unfair Advantage In Business... and in Life! ? ?Turn Words Into Traffic? How to write and publish articles online that bring an ?avalanche? of website visitors and customers! ? ?eBook Secrets Exposed? How to make massive amounts of money with your own ebook? whether you wrote it or not! ?The Lazy Man's Guide to Online Business How to Work Less... get Paid More... and have tons more Fun! Learn the Super ?Lazy Achiever? Mindset! ?Affiliate Link Cloaker Software Keeps Internet ?Pickpockets? from stealing your affiliate commissions! ?Selling Your Home Alone Sell your house yourself and save THOUSANDS in Realtor commissions! ?The TEN Dirty Little Secrets of Mortgage Financing How to save THOUSANDS in fees and unnecessary interest on your next mortgage loan! ""I think that if William Shakespeare and Charles Dickens were online, they'd spend lots of time visiting Joe Vitale's and Jim Edwards' site to learn how they could write and publish their own eBooks in as little as 7 days."" -- Jay Conrad Levinson ""Author, ""Guerrilla Marketing"" series of books www.JayConradLevinson.com""